Construction is well underway at one of Chicago's most notoriously congested and dangerous intersections: the confluence of Elston, Fullerton and Damen avenues. It's a major project that's reshaping a diagonal street by adding a rare curve to the city's famous grid. However, the final fix is still well over a year away and the realignment required one iconic Chicago business to get out of the way. Eddie Arruza reports on Chicago Tonight. 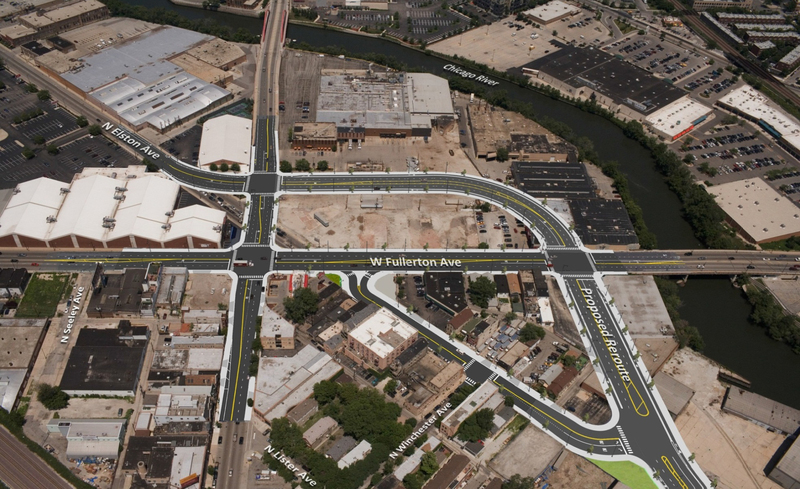 The $60 million project will convert the six-way intersection into three independent intersections at Elston, Damen and Fullerton avenues. Elston will be rerouted around the existing intersection. Multiple properties had to be acquired to make way for the roadway improvements, including a former Dunkin Donuts restaurant, the former WhirlyBall building, the former Chicago Sun-times warehouse, a section of the Vienna Beef parking lot and part of the east building of the Midtown Tennis Club. According to the Chicago Department of Transportation, the existing intersection has been ranked as one of the top 10 crash locations in the city since 1999 and around 70,000 vehicles travel through it daily. CDOT says that the new roadway will be more bicycle- and pedestrian-friendly, with a protected bike lane and wider sidewalks, and that the increased distance between the intersections will improve safety, the flow of traffic, and promote economic growth in the area. For a detailed presentation of the project, click here. Below, a slideshow illustrates various phases of the project.